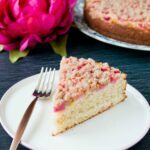 This incredible crisp is made with a sweet and tart rhubarb filling and it’s topped with a crunchy oat and brown sugar streusel. 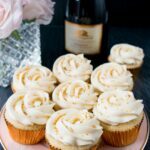 It can be served warm or cold, and is great with a dollop of whipped cream or scoop of vanilla ice cream for a summer treat! I’m just loving rhubarb right now. There is something intriguing about a vegetable that acts like a fruit. What looks like pink celery cooks up delightfully soft and tender with a tangy apple-like flavor. 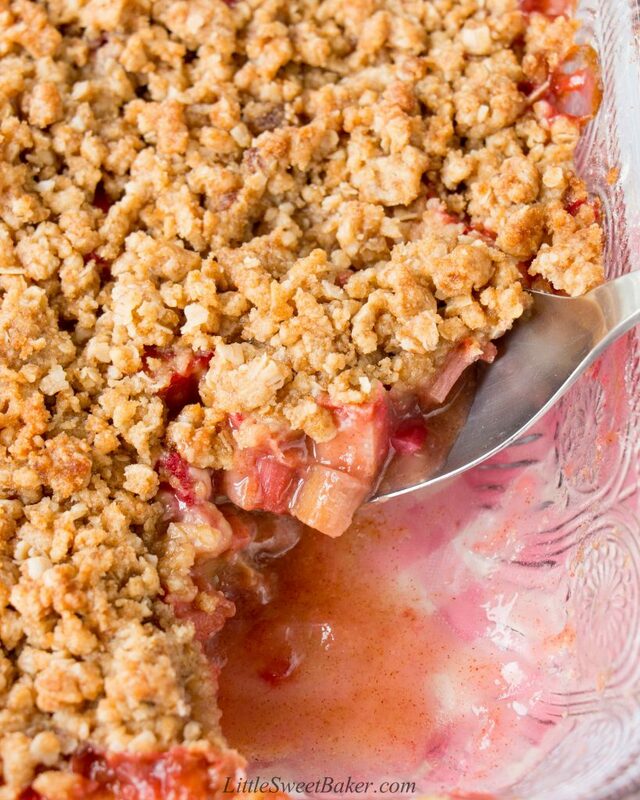 This recipe starts with over a pound of rhubarb tossed in some sugar for sweetness, flour to thicken and cinnamon for flavor. Then you mix together some flour, rolled oats, brown sugar and melted butter to make the streusel. 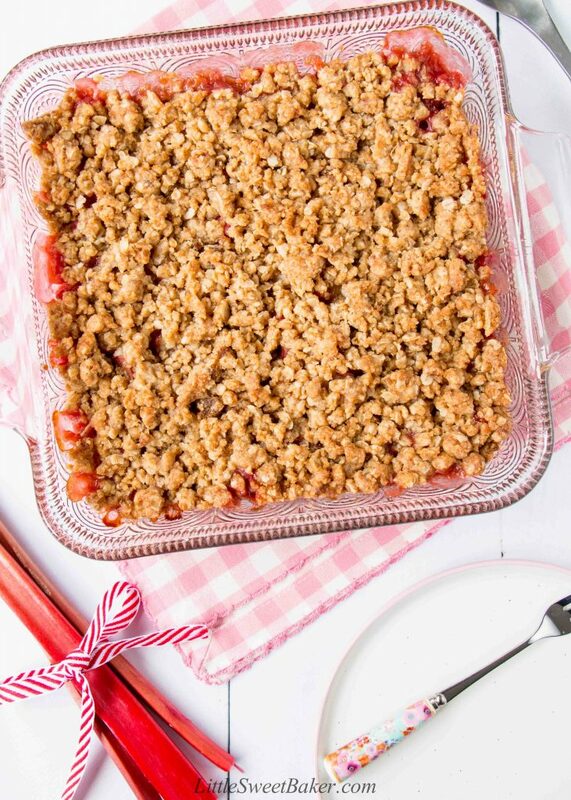 Sprinkle that over the rhubarb, bake until bubbling, and there you have it – a delicious “fruit” crisp ready to be served. 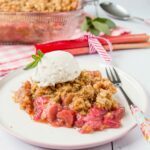 This rhubarb crisp has a lovely crunchy and soft texture with its buttery brown sugar topping and juicy-tart filling. It’s rustic and homely, yet absolutely scrumptious! 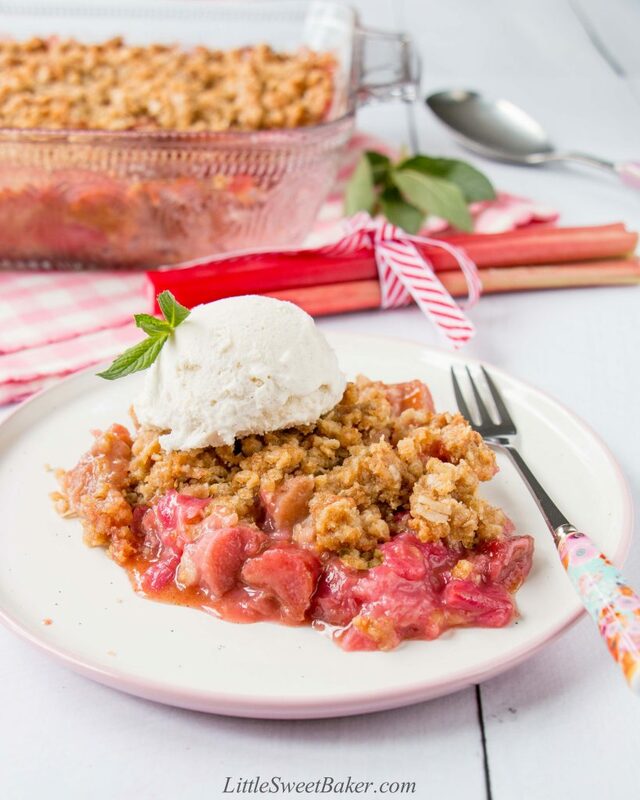 This incredible crisp is made with a sweet and tart rhubarb filling and it’s topped with a crunchy oat and brown sugar streusel. 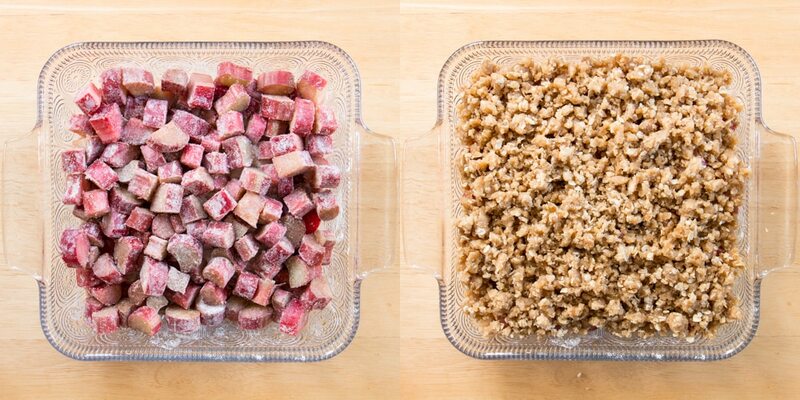 To prepare the filling: toss together the rhubarb, sugar, flour and cinnamon in a large bowl until all the rhubarb is thoroughly coated. Transfer into an 8×8″ baking dish. To prepare the topping: mix together the flour, rolled oats and brown sugar. Pour in the melted butter and mix until all is moistened. 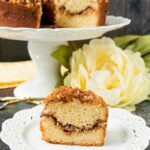 Using your hands, break up the streusel into bite-size pieces and sprinkle evenly over top of the filling. Bake for 40-45 minutes or until the top is lightly browned and the filling is bubbling. Serve warm or cold with some sweetened whipped cream or vanilla ice cream if desired. I’ll be sharing this at Fiesta Friday #227 hosted by Angie, and co-hosted by Lizet @ Chipa by the dozen and Jhuls @ The Not So Creative Cook. This looks amazing! I am excited to try it out very soon! Thank you for your kind words, and I hope you enjoy the crisp! I would gladly enjoy this delicious treat! Sounds so yummy! Thanks for sharing, Lily. Happy Fiesta Friday! You’re welcome, and thank you for co-hosting again!